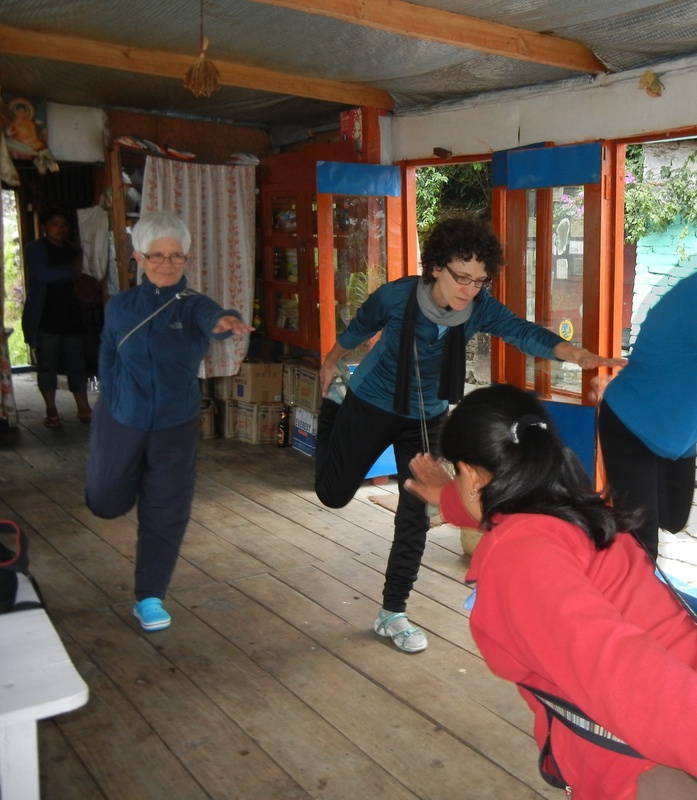 Up and packing at 6:45AM; our troupe of 9 women engaged in a yoga session after breakfast led by our tour guide – we all share the same thoughts on how to fend off age – just keep moving and don’t look back! On the trail an hour later. It is still foggy. Yesterday was a warm-up for today’s journey, which is twice as long, twice as high. Happily DB shows no symptom of altitude sickness or exhaustion today, even though we are constantly gaining altitude. 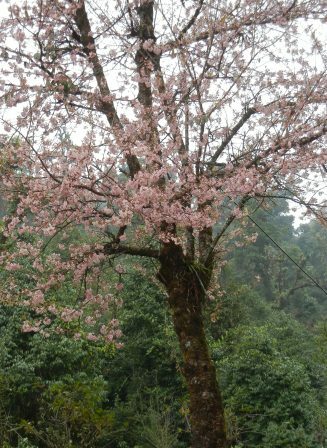 We left the rain forest behind and below, and walked instead past orchards of cherry trees in full blossom. Occasional drizzle brought out the rain covers and water-proof parkas. Today’s segment was billed as 5 hours of walking; we stretched it to 10 hours, with breaks, including close encounters with bullock carts, pony caravans, and a herd of goats. At intervals along the trail there are stopping spots, walls of stone with two steps constructed at a height convenient for the porters to lean against the lower step while resting their carefully-balanced baskets on the ledge. The design works equally well for backpacks. Tip to trekkers: be careful to sit ON the stone bench if possible. Nepal boasts a species of stinging nettle which can penetrate a pair of lightweight trekking pants with no trouble. It’s not a memory you will cherish! 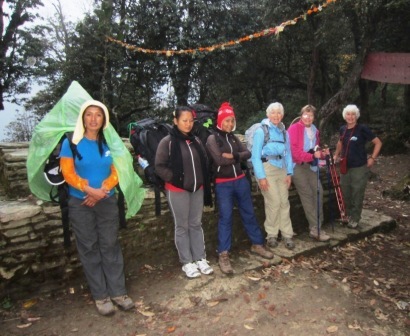 We finally arrived at Lower Ghorepani at 5PM. Ghorepani is a nest of bright-blue-painted guest houses, all claiming the best view of the Annapurnas. Due to the persistent overcast, we had no way to judge. We shambled past guest house after guest house and finally a good half hour later reached ours – the Sunny Guest House. We are told that in clear weather from here the view is terrific. Tomorrow, if the skies are clear in the early morning, we will get up at 4:30 AM and hike another mile uphill to get the panoramic view of the Annapurnas from Pun Hill. Tonight again it pours rain.